Click here to see all awards we’ve won. 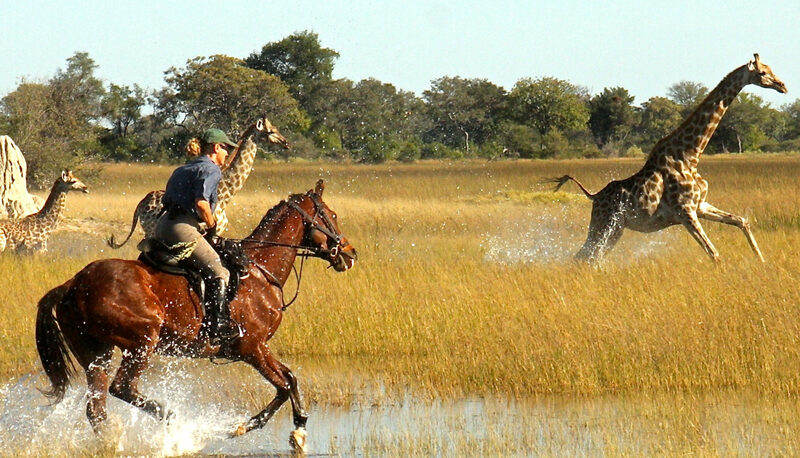 Cantering alongside the elegant motion of a giraffe is an experience you will never forget and the only sounds you will hear, as the wind sighs through the grass and rattles the palms, are the fisheagle’s haunting cry, the splash of a disappearing crocodile and the faraway drumming of hooves. 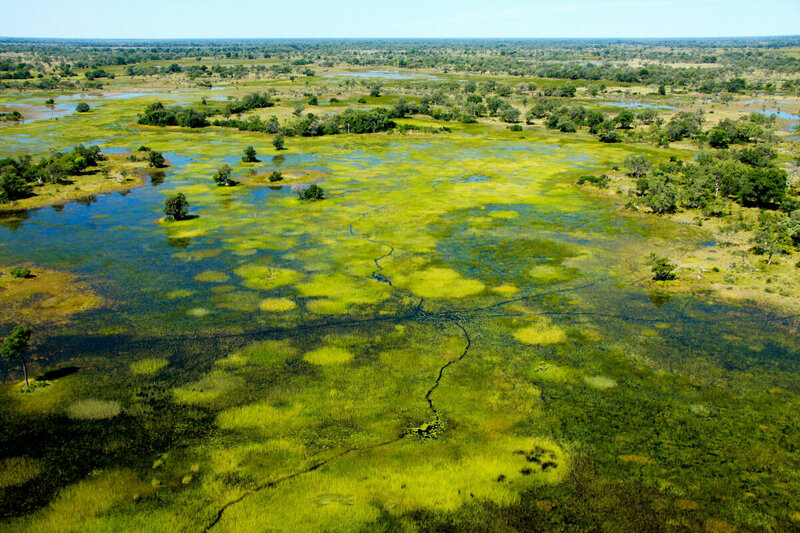 Imagine yourself mounted high above the long grass and reeds watching great herds of wildebeest and lechwe as they move across the golden floodplains. 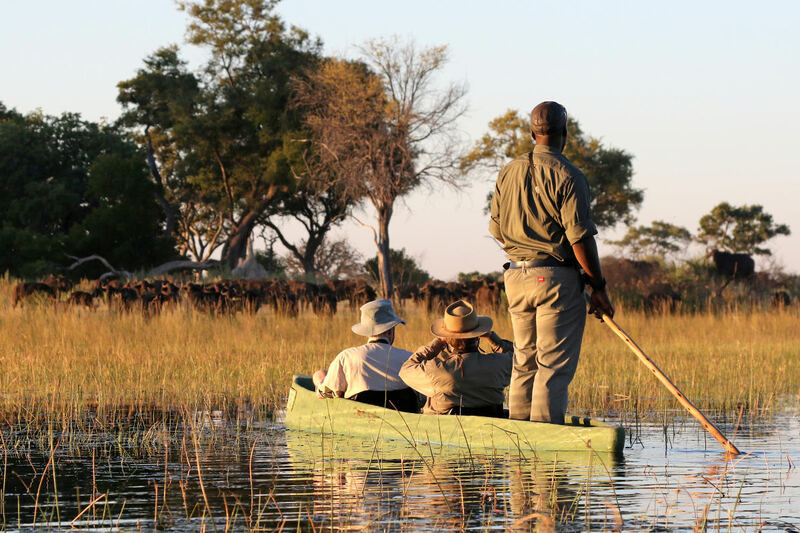 The breathtaking excitement when your silent progress along game paths only used by animals brings you upon a herd of buffalo or a family group of elephant. 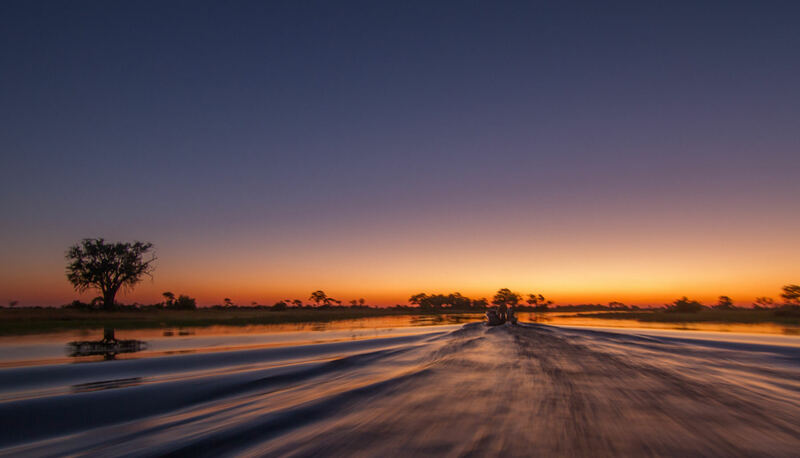 As the blood red sun drops into the black of night, the hyena’s whoop-de-whoop and the lion’s roar accompany your fireside reverie and the hippo’s watery grunt punctuates your dreams. This is as close to nature as you will ever get. 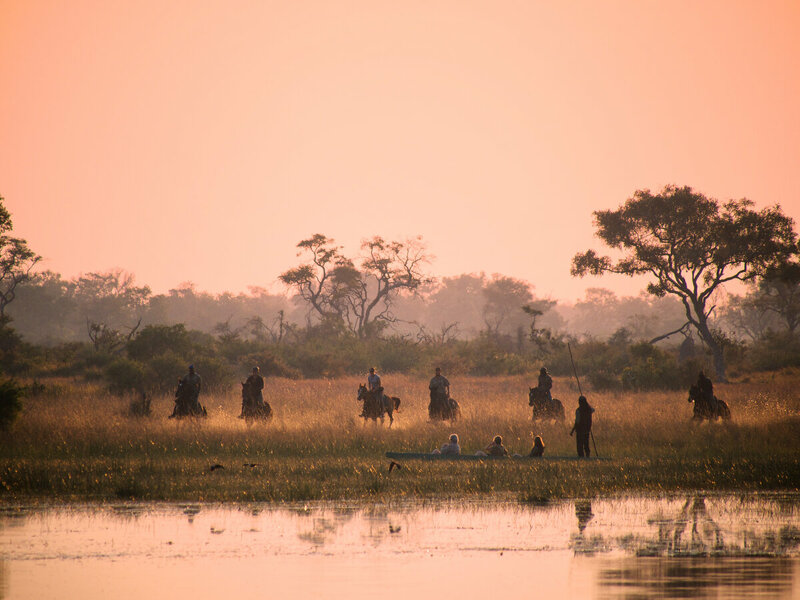 Founded in the 80’s by PJ & Barney Bestelink, Okavango Horse Safaris will give you a safari experience that you will never forget. 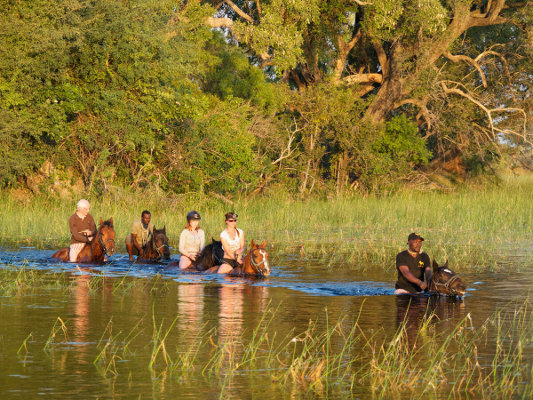 Riding on horse back in groups of 8 or less, this is the most intimate way to experience Okavango’s wildlife and beauty. 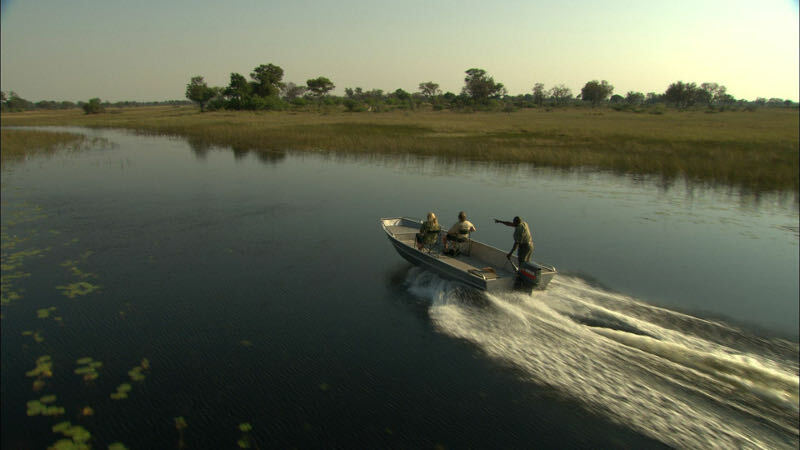 With Okavango Horse Safaris, you’ll experience breathtaking wildlife and scenery, extremely knowledgable guides and staff, the most comfortable bush accommodation, all backed up by an exceptional safety record. Thank you to everyone for creating such a wonderful experience for us. The horses were first class – especially Lima and Dothraki! Kevin particularly enjoyed his encounter with the lion and lioness – a big thanks to Percy for looking after him so well. Caroline was thrilled to canter with giraffe and zebra. David appreciated seeing the leopard. Very best wishes to all staff who made us feel so very special. Too many memorable moments to list from the few days I’ve been here, my abs are as sore from laughing as they are from riding and my face hurts from wearing the biggest grin the past three days. So grateful for the experience, to have met such wonderful people, to ride such beautiful horses and have some epic experiences with the local wildlife. Thanks to everyone for making this an incredible trip – I’ll be bragging about the experience for some time and telling so many people to visit and experience a safari or horseback with OHS. Cheers. To PJ, Barney and every single staff member. Sadly have to leave this wonderful place and its lovely people. Thank you for having me and sharing this beautiful paradise. Loved the rides and learnt a lot from Rodgers. Felt at home from day one. 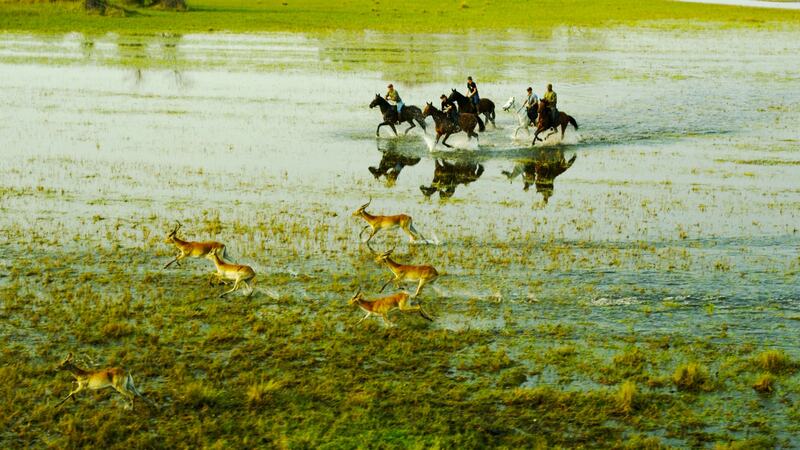 Mokowane – beautiful – would’ve loved to stay there longer and make the journey on horseback – next time! Lovely to see the horses roam free in a herd as nature intended. Happy horses! So much to do so little time… A BIG BIG THANK YOU!! Thank you for the fantastic five days of wonder. 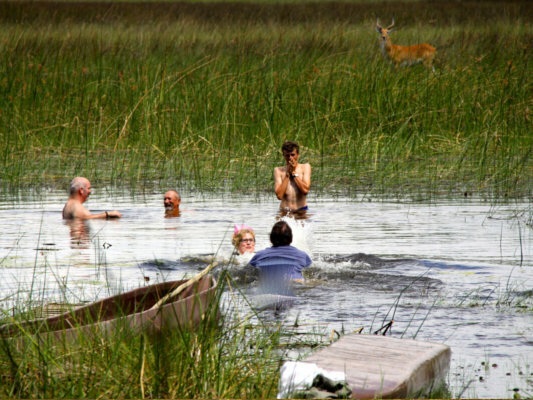 Our family had such a great time and truly enjoyed our time at Kujwana and Mokawane. The highlight was our experiences with Percy and Rodgers – we will ever forget the “Bush Brothers” – their antics and stories are etched in our memories. 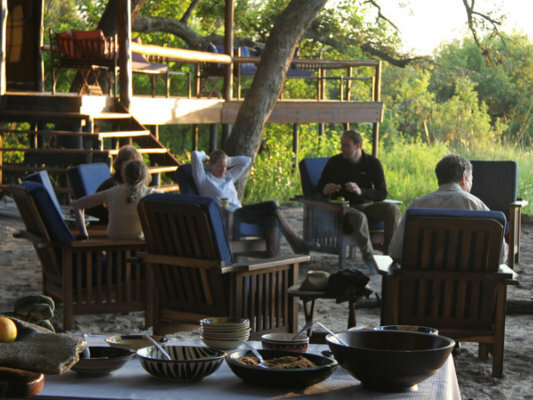 The staff were fantastic also although I will always look at curried chicken in a different light – thinking of baboons! Thank you again for everything. 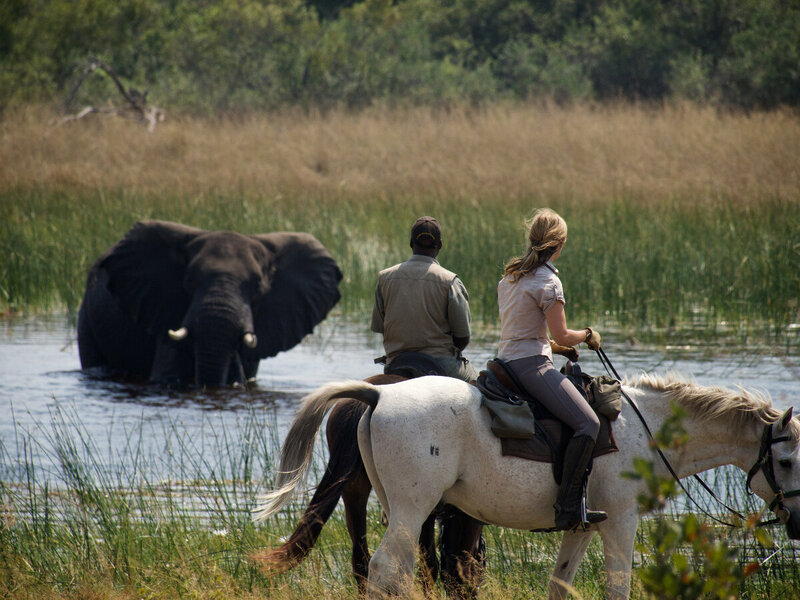 Riding on horse back has to be the best way to experience the Okavango Delta, but we’re not all about riding. 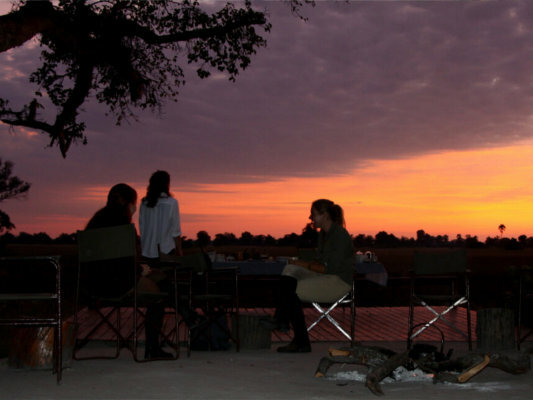 If you or one of your group is not a rider we can arrange fantastic non-riding itineraries that they will absolutely love. 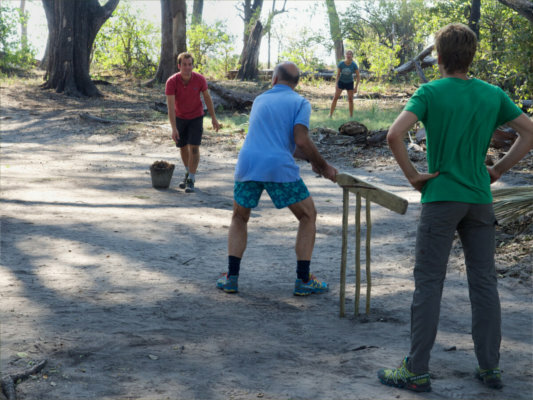 Even our riding trips are interspersed with other activities. With an exceptional stable of 60 horses, we have horses to suit riders of all abilities. 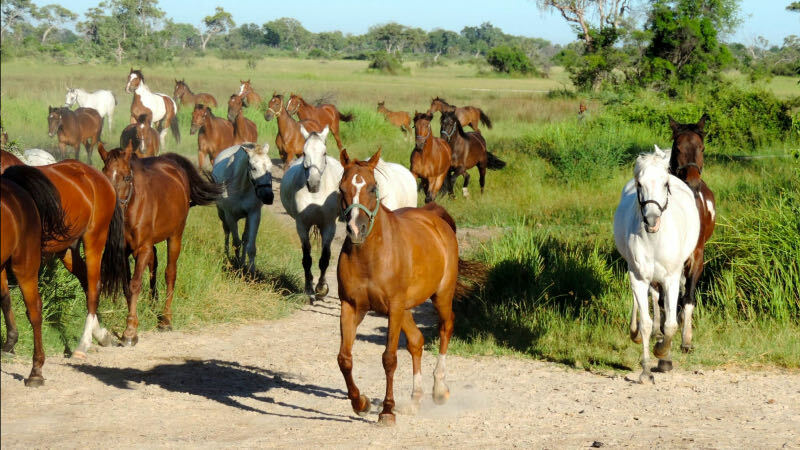 From Thoroughbreds, to Arabians, to our home-bred ‘Botswana Warm Bloods’, we know you’ll enjoy each horse you ride. 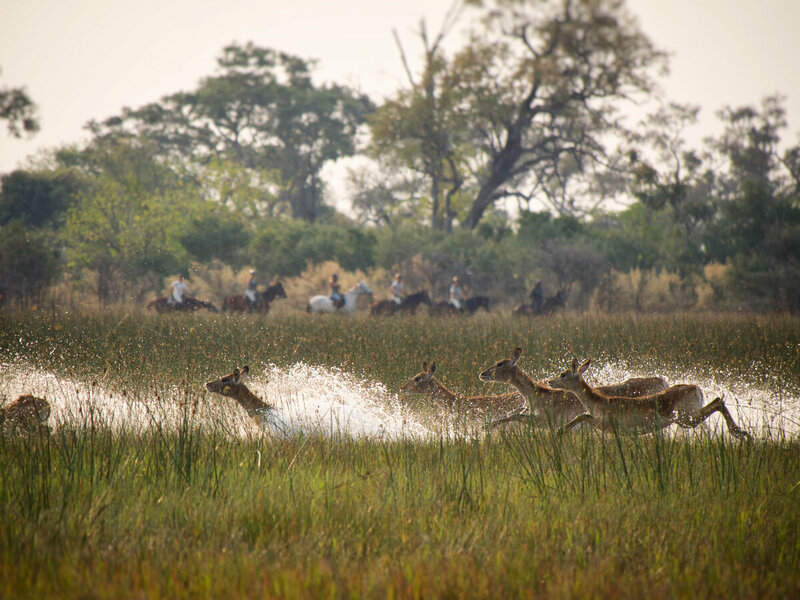 Established in 1986, Okavango Horse Safaris is the original horse safari in Southern Africa. With three decades’ experience, our team is highly experienced, which means they will show you a good time, and more importantly keep you safe.